This Is Uh… Not Cutting It. Yet. I’m not going to be very popular in a minute or so. I get that. And I accept that. But if I’m being completely honest (the whole point of a blog), I have to reveal: my love for This Is Us is waning and dammit, I simply refuse to believe I am alone here. Hold onto those rocks, people, I don’t dislike the story of the Pearsons and I’m not throwing in the towel on them. I – along with everyone else – was unabashedly hooked by the time the how-is-that-guy-smoking-in-a-hospital scene blew this show into the stratosphere. It’s still a sweet little show and I think it’s got a nice thread of affection weaving through it and making it a pleasant hour of television. (A bonus: it’s got Susan Kelechi Watson, whose Beth is single handedly the coolest mom on television.) But (dramatic pause here, waiting for the haters to assemble) it’s not Parenthood. Alas, I am Team Braverman for life and I really thought this show was going to fill that deep void. I’m finding it’s not. So I’m a little bummed because I was counting on it. Parenthood was my hands down reality check. People screwing up with their kids? Yep. People making mistakes with their significant others? All the time. Kids behaving badly and seeing consequences for that? Yessiree. When Kristina was going through her chemo treatments, it was hard for me to watch and harder for me to breathe, having just gone through it with my mom. It was steeped in realism and throughout the years, their struggles became our strength: viewers knew if the Bravermans got through it, we could too. Exhibit A: We already know Jack and Rebecca don’t end well. Every fight they have now seems like another nail in their 80s-lacquered-coffin. It’s gotten to be a little dose of dread in every scene they share together. Exhibit B: William’s impending death. Finding out in what, episode 2, that a well-liked character is on the way out gives little reason to become very vested in him (although I hear “Bates Motel” is making a go of it. Creepy fun coming from that network but I digress). We simply watch each episode wondering, is this the one…..
Exhibit C: Kate. This may be nit-picking but how does she pay her bills? I remember her interviewing for and then getting a job for a day or two but then she quit and …. flying to the east coast for the holidays, a couple of weeks as a hospital visitor and now an undisclosed amount of time at a fancy exercise farm? Whaaaat? Who can check out of life like that? I don’t want to do online research to find out her back story but what’s her deal? What’s she been doing for 15 year of an adult life that affords her such luxury of time and money? Until that’s explained, I’ll keep shaking my head and finding her storyline wayyyyy unrealistic. So I’ll stick with “This Is Us” to see if the frenetic pace of A CRISIS IS COMING AROUND THAT BEND BUT YOU’LL HAVE TO STAY TUNED TO SEE WHAT … slows to a reasonable rhythm. I won’t desert them. It’s as if the writers are afraid of losing viewers if they slow down the “A-ha!” moments and spend an episode or four fleshing out their (talented) cast of characters. To that I say, trust us. We know good shows when we see them. And we stay faithful to them. Like the Bravermans taught us. 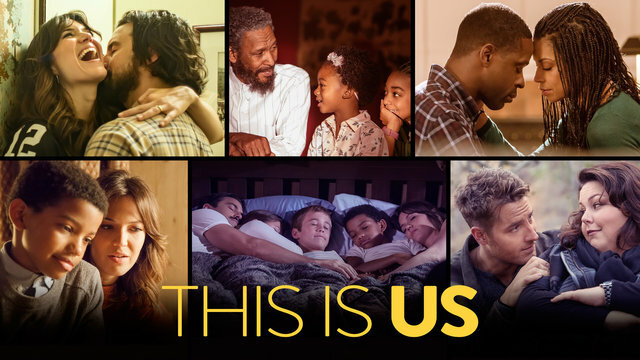 This entry was posted in Uncategorized and tagged Braverman, Eyerollingmom, fans, NBC, Parenthood, Pearsons, Susan Kelechi Watson, television, This Is Us, tv, viewers on February 19, 2017 by Tina Drakakis.